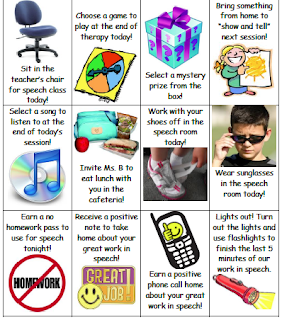 Speech Language City: Incentivizing WITHOUT Candy and Stickers! Incentivizing WITHOUT Candy and Stickers! Many of us struggle with how to keep kids engaged and motivated about participating in pull-out therapy. It can sometimes be stigmatizing for kids to see the SLP, or therapy may pull them out of one of their favorite subjects and from their friends. I feel that all too often we turn to behavioral reinforcements to placate these battles - A sticker chart for attendance, a lollipop after therapy, M & Ms during an activity, etc. While these reinforcements (or better yet, "bribes") do work in the short-term, I feel that the message is confusing for kids and we end up breeding long-term bad habits, not to mention it can be quite an expense for the SLP to maintain. It can be difficult for a child to understand why he or she has less stickers than another child for a therapy schedule in which he or she has no control over the frequency of sessions. Candy rewards send the message that after a job well done, you deserve something sweet - whether or not you're actually hungry! And have you have tried to take away a candy reward if the student did not work effectively during the session?! MAJOR meltdown territory. See these sites for more about caveats about candy-based and other extrinsic reward systems: Clemson University Cooperative Extension and Smart Classroom Management. I plan to use these rewards in conjunction with another system which will keep the actual reward schedule varied and random. Thanks again to Pinterest for introducing me to this awesome (and FREE) system: A bulletin board sized Chutes and Ladders game! I love the idea of using photo cut-outs of my kids attached to thumbtacks as the game pieces. 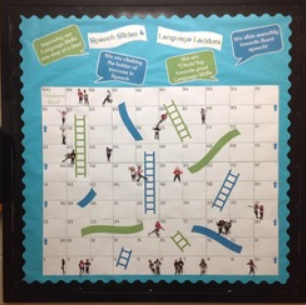 Create the Chutes and Ladders game on the bulletin board by the door (I plan to make mine a bit smaller - Maybe only 6-7 rows high. Cut and laminate the reward cards. Attach cards around the frame of the bulletin board with velcro. Students earn one roll for coming to therapy and a bonus roll at the end of the month if they bring back their completed homework calendar. They could also earn another roll if they do something exceptional. Students can choose a prize off of the bulletin board frame after they have reached the top of the game. I'll try to post some pictures after I get it all set up. Do you have a reward system in place in your speech room? What are your thoughts on reinforcement? UPDATE 8/24/13: My new bulletin board is looking fabulous, if I do say so myself! I've gotten a ton of compliments from other teachers on the unconventional rewards system. We had an open house on Friday and the speech kiddos were very excited about it as well - It looks like the most popular reward is going to be "sit in the teacher's chair"... Guess I'm going to have to get used to tyke chairs! Love it! I printed it today and I'm going to put it up tomorrow. I'm an SLP from a medical background and now I work in schools. I don't have a lot of patience for creating my own materials. I'm not very pinteresty, you might say! So I rely on the internet! Thanks!